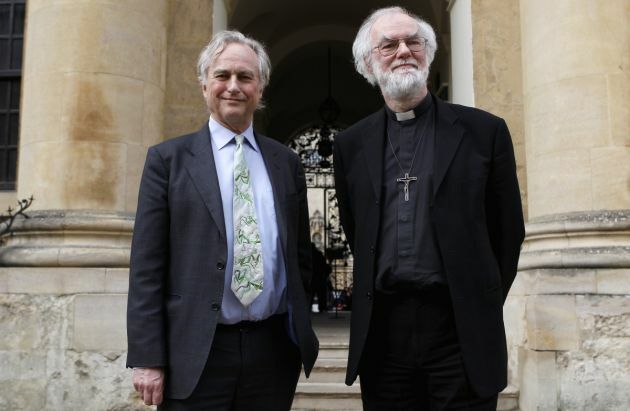 (Photo: Reuters / Andrew Winning)The Archbishop of Canterbury Rowan Williams (R) and atheist scholar Richard Dawkins pose for a photograph outside Clarendon House at Oxford University, before their debate in the Sheldonian theatre in Oxford, central England, February 23, 2012. The name of the debate is ?The Nature of Human Beings and the Question of their Ultimate Origin? University of Oxford's Balliol College has banned Christian Union representatives from attending its freshers' fair over concerns at the "potential for harm" to them and it has stirred a backlash. Balliol Christian Union was told the college's student body, known as the JCR (junior common room), wanted the freshers' fair to be a "secular space," the Oxford student newspaper Cherwell reports. The JCR committee initially attempted to prevent any Christian Union representation, stating it "couldn't guarantee every major belief system" would be represented, which risked "alienating" new students. Discussion between the Christian Union and the JCR Vice President Freddy Potts, followed. The Christian Union was eventually told permission would be granted for a single multifaith, but on the condition that it had no representative of any society manning it. The Cherwell reported that ban provoked a backlash within Balliol, with a JCR motion passed unanimously Oct. 8 accusing the JCR of "barring the participation of specific faith-based organizations." The meeting described the step as "a violation of free speech [and] a violation of religious freedom." The student body motion states: "the Balliol JCR should not make judgements regarding the legitimacy of faith groups or religious expression." The motion prohibits the JCR from barring any official religious societies from participation in the Balliol freshers' fair in future. The student newspaper reported that during the initial email exchange, JCR Vice President Freddy Potts, on behalf of the JCR Welfare Subcommittee, had justified the ban. He told a Christian Union representative: "We recognize the wonderful advantages in having CU representatives at the Fresher's Fair, but are concerned that there is potential for harm to freshers who are already struggling to feel welcome in Oxford." He had also said: "Our sole concern is that the presence of the CU alone may alienate incoming students. "This sort of alienation or micro-aggression is regularly dismissed as not important enough to report, especially when there is little to no indication that other students or committee members may empathize, and inevitably leads to further harm of the already most vulnerable and marginalized groups." Commenting on the ban Rev. Nigel Genders, the Church of England's chief education officer, was quoted as saying in The Guardian newspaper: "Freedom of religion and belief is a fundamental principle that underpins our country and its great institutions and universities. "Christian Unions represent some of the largest student led organizations in many universities across the country and to exclude them in this way is to misunderstand the nature of debate and dialogue and at odds with the kind of society we are all seeking to promote." The University and Colleges Christian Fellowship said Christian Unions provide a caring, supportive community to 20,000 students across the United Kingdom each year. It said that last year, 40 unions were either nominated or awarded student union awards for their contribution to university life. Rev. Richard Cunningham , director of the fellowship said, "We are however concerned that the current desire to provide safe spaces on campus does not infringe on the core liberties of freedom of speech and freedom of association which are surely foundational to the university experience and indeed to basic human flourishing."